There are two main radar beam aspects to consider when viewing images from any Doppler radar. The first one deals with the beam spreading as it moves farther from the radar transmitter. The second is how the beam bends, called refraction, as it travels through the atmosphere. While often depicted as a cone with distinct edges, the radar beam is better visualized much like that of ordinary household flashlights. In a darkened room take a flashlight and, while standing 10 feet away or more, shine it on a wall. You will notice the bright area around the center of the beam but will also notice you can see the brightness fade farther away from the beam's center point. You will also notice the width of the beam changes as you move toward or away from the wall. The beam of energy transmitted from the Doppler radar is no different. A conical shaped beam is formed as the energy moves away from the radar. And it is near the center line of the beam where most of the energy is located with the energy decreasing away from the centerline. By convention we define the width of the beam as the distance between the two half power points - the point where there is a 50% reduction in the radar's transmitted energy. For the NWS Doppler radar, the angle between the two half power points is one degree. Outside of the half power points, the energy rapidly decreases. It is easy then to see that the actual physical width of the radar beam depends upon the distance to the radar. The width of the beam expands at a rate of almost 1000 feet for every 10 miles of travel. At 30 miles from the radar, the beam is approximately 3,000 feet wide. At 60 miles, the beam is about 6,000 feet wide. At 120 miles the beam is nearly 12,000 feet or over two miles wide. Beam spreading - view from overhead. This beam width spreading affects the resolution capability of the radar. Small features, which can be seen close to the radar, are often obscured when these same feature are located at great distances. This decrease in resolution, at increasing distances, is often why a solid line of thunderstorms appears to break-up as it approaches the radar. In reality, the line of thunderstorms may have never been solid in the first place; it is just the lack of resolution of the "gaps" that causes the radar to "see" a solid line. The spreading beam also causes differences in the appearance in the strength of storms. Of two identical storms (same strength, height and width), one at 60 miles and one at 120 miles from the radar, the storm at 60 miles will appear stronger as it fills more of the radar beam which returns more energy. Beam spreading also causes "partial beam filling," which says that distant targets occupy less of an expanded beam. Therefore, the true image of the storm is usually altered when displayed. In addition to beam spreading, the beam also does not travel in a straight line. The beam is bent due to differences in atmospheric density.These density differences, caused by variations in temperature, moisture, and pressure, occur in both the vertical and horizontal directions and affect the speed and direction of the radar beam. The more dense the atmosphere the slower the beam travels. Conversely, the less dense the atmosphere the faster the beam travels. These changes in density can occur over very small distances so it is common for the beam, as it spreads, to be in areas of different densities at the same time. The beam will bend in the direction of the slower portion of the wave. The atmospheric density naturally decreases with increasing elevation and is primarily due to the decrease in air molecules, and consequently air pressure, as elevation increases. This means the top portion of a beam in the atmosphere can move faster than the bottom portion. Under normal atmospheric conditions, when there is a gradual decrease of pressure, temperature, and humidity with height, a radar beam's curvature is slightly less than the earth's curvature. However, atmospheric conditions are never normal. If the decrease in density with height is more than normal (the actual density is less than normal) then the beam bends less than normal and climbs excessively skyward. This phenomenon is known as subrefraction. Subrefraction causes the radar to overshoot objects that would normally be detected. Distant thunderstorms might not be detected with subrefraction as well as under reporting the intensity as the beam hits only the top portion of the thunderstorm cloud. Conversely, if the decrease in density with height is less than normal (the actual density is greater than normal) then the beam bends more than normal and is curved more toward the earth's surface. This phenomenon is called superrefraction. Superrefraction causes the radar beam to be closer to the earth's surface than what would occur in a normal atmosphere. This can lead to overestimating the strength of a thunderstorm as the beam would be detecting more of the core of the storm versus the weaker upper levels. 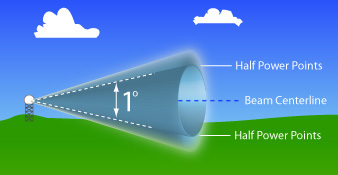 If the atmospheric condition that causes superrefraction bends the beam equal to or more than the earth's curvature then a condition called ducting, or trapping, occurs. Ducting often leads to false echoes also known as anomalous propagation or simply AP. How do we know the path of the beam all times? Aside from when AP is seen on the radar, we don't! To know the path of the beam would require us to know the exact composition of the moisture, temperature and pressure in the atmosphere, up to 70,000 feet, every minute or so, within about 240 miles of the radar and that capability does not exist.